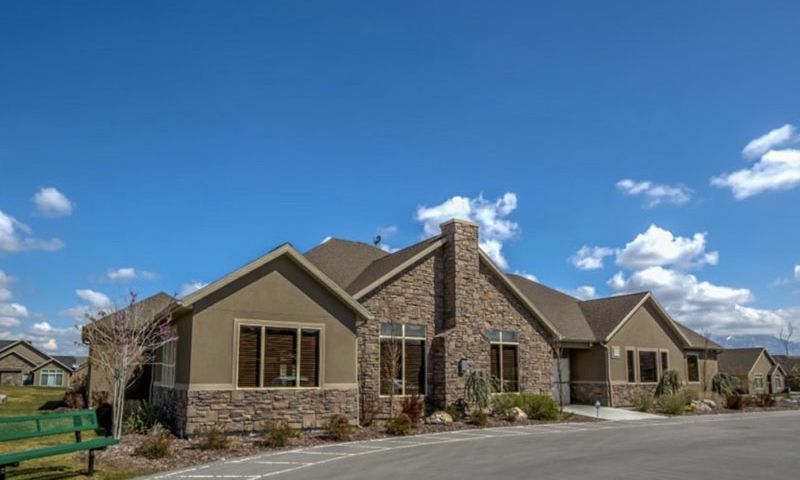 Bridlewood Villas is a 55+ community in West Jordan, Utah. This active adult neighborhood offers spacious and beautiful attached homes that include single-level living with great features like spacious garages, courtyards, and elegant master suites. Residents enjoy the convenience of living at Bridlewood Villas thanks to the homeowners' association (HOA) that takes care of exterior home maintenance. Homeowners also have access to a charming clubhouse with many great amenities as well. West Jordan, Utah, provides residents with a central location that has plenty of dining and shopping nearby. Homeowners will never be far from everyday conveniences as well as attractions that the Salt Lake City area has to offer. The central hub of fun is at the Bridlewood Villas clubhouse. Here, residents can stay fit in the exercise room or host an event in the multi-purpose room. They have access to a catering kitchen, billiards table, movie theater, library, and multi-purpose room that they can use to host parties. Outdoor amenities include a pool and patio where homeowners can get out and enjoy fresh air. There is also a BBQ area that can be used to grill a delicious meal for their friends and neighbors. Construction of Bridlewood Villas began in 2000 by builder Leisure Villas and consists of 156 residences. Homebuyers can choose from three distinct floor plans that offer energy efficient designs and main-level living. These attached homes range from 1,602 to 1,971 square feet with two bedrooms, two bathrooms, and an attached two-and-a-half-car garage. All residences have spacious layouts, walk-in closets, inviting kitchens, vaulted ceilings, private patios, and sun rooms. Bonus rooms may be added for personalization and additional space in certain models. These homes are attached to three other units but still offer a private entryway. Thanks to a monthly HOA fee, residents don't have to worry about yard work or exterior-home maintenance. Homeowners living in Bridlewood Villas enjoy an active and social lifestyle. Here, they can attend movie nights, game nights, and dinner parties. The community hosts events like barbecues, picnics, and holiday parties where neighbors can come together to socialize and have fun. They have endless options to mingle at the clubhouse, play billiards or card games, or prepare snacks for club meetings. Ideally situated in West Jordan, Utah, Bridlewood Villas is close to everyday conveniences and attractions. Interstate 15 and Route 89 make it easy to drive around town. Residents have plenty of shopping options nearby like The Home Depot, River Pointe Plaza, and Smith's. Golfers will enjoy being near Mountain View Golf Course and River Oaks Golf Course. For big-city entertainment, Salt Lake City is a 20-minute drive. When traveling long distance is required, homeowners can fly out of Salt Lake City International Airport. Bridlewood Villas is the ideal 55+ community near Salt Lake City. There are plenty of activities available in Bridlewood Villas. Here is a sample of some of the clubs, activities and classes offered here. There are three floor plans available at Bridlewood Villas. They range from 1,602 to 1,971 square feet with two bedrooms, two bathrooms and an attached two-and-a-half-car garage. All models have spacious layouts, walk-in closets, inviting kitchens, vaulted ceilings, private patios, and sun rooms. Bonus rooms may be added for personalization and additional space. These homes are attached to three other units but still offer a private entry. 55places.com is not affiliated with the developer(s) or homeowners association of Bridlewood Villas. The information you submit is distributed to a 55places.com Partner Agent, who is a licensed real estate agent. The information regarding Bridlewood Villas has not been verified or approved by the developer or homeowners association. Please verify all information prior to purchasing. 55places.com is not responsible for any errors regarding the information displayed on this website.